Surprise your friends! Astonish your family! 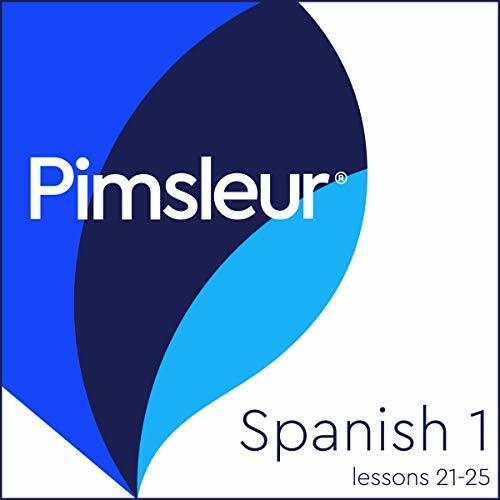 With Pimsleur®, you’ll be speaking and understanding Spanish like a native in no time. Thirty minutes a day is all it takes! This course includes Lessons 21-25 from the Spanish Level 1 program featuring two-and-a-half hours of language instruction. Each lesson provides 30 minutes of spoken language practice, with an introductory conversation, and new vocabulary and structures. Detailed instructions enable you to understand and participate in the conversation. Practice for vocabulary introduced in previous lessons is included in each lesson. The emphasis is on pronunciation and comprehension, and on learning to speak Spanish. ©2018 Simon & Schuster, Inc. Pimsleur® is an imprint of Simon & Schuster Audio, a division of Simon & Schuster, Inc. Mfg. in USA. All rights reserved. (P)2018 Simon & Schuster, Inc. Pimsleur® is an imprint of Simon & Schuster Audio, a division of Simon & Schuster, Inc. Mfg. in USA. All rights reserved. I have loved the previous Pimsleur audiobooks, it's supplementing my weekly Spanish class and I was learning it at a reasonably quick rate. But from the last tape with lesson 20, jumping to this tape with lesson 21, I'm lost. The speakers are different, they speak much more quickly and one of them almost mumbles. There are vocabulary words used that I don't know which have never been introduced. There is a "reading review" where it sounds like someone is reading numbered sentences, but I have no text to follow. Also, I always listen in the car so this is worthless even if I had the text. Listening to this lesson over and over again, I've started to be able to follow along, but it is a lot of work. I'm not sure why the format changed so much, the previous lessons worked much better for me as a new Spanish learner.